The phrase giving journey is often used to describe the mental path from potential giver to awareness to first gift. If nonprofits want to go beyond one-and-done gifts, however, they must understand and nurture the journey beyond that initial gesture: the giving lifecycle. The lifecycle is a simple map that documents the maturation of a giver’s relationship with a nonprofit from occasional to repeat giver, to mid-level, multi-year givers, to the ultimate “destinations” of major, multi-year and bequest giving. Through data analysis, nonprofits can now recognize the behavior and mindset associated with each giving level, making it possible to predict next steps and encourage givers along this path. However, unless we recognize that givers’ personal journey is what actually moves them, we will fail to touch the deepest motivations that foster greater giving. We can end up treating benefactors as checkbooks, reducing their overall lifetime value. In other words, to move givers through the lifecycle, you must “move” them. The question is, what moves them? Events have long been a staple in the fundraiser’s playbook. Lately, though, they’ve come into question as the cost and effort of organizing them has risen sharply, along with the competition for contributor dollars and the scrutiny of nonprofit stewardship. And rightfully so. On the one hand, nonprofits should question the ROI of all their fundraising strategies, over time and relative to other fundraising methods. This is especially true for events because they are always at risk of costing more than they bring in. · 80% of Americans believe it’s essential for people to come together in person to promote positive change. · 71% of Americans agree that attending live events makes them feel more connected to other people, the community, and the world — a sentiment that has increased since 2014 (66%). · 70% of American men and women agree that attending a live event has been more successful at expanding their perspective than just reading about a topic online. · 84% of people believe that all types of live events can inspire positive change for the country. · 73% of millennials consider attending an event a form of expression (compared to 48% of other cohorts). Events clearly play a role in connecting givers to causes. While it’s important to reduce fundraising costs (both direct and indirect), creating authentic connections with givers across the lifecycle is the key to cultivating greater generosity that shifts ROI on the other end, raising more funds in the long run. This is where events can shine. Nonprofits whose only touchpoints with their supporter base are giving requests soon start to be seen as bill collectors. Events break that cycle by offering something in return, while building community goodwill, reenergizing current givers, and facilitating new name acquisition. In this way, they fuel the beginning and middle stages of the lifecycle. At the same time, it’s best not to justify continuing a poorly performing event by calling it a friendraiser. If an event’s profit margin consistently falls below the industry target of 70-80%, and new-name acquisition doesn’t yield significant engagement despite diligent follow-up, reconsider this particular event. It may not be a good fit for your target audience. Pro Tip: Consider hiring an event organization to run the event. 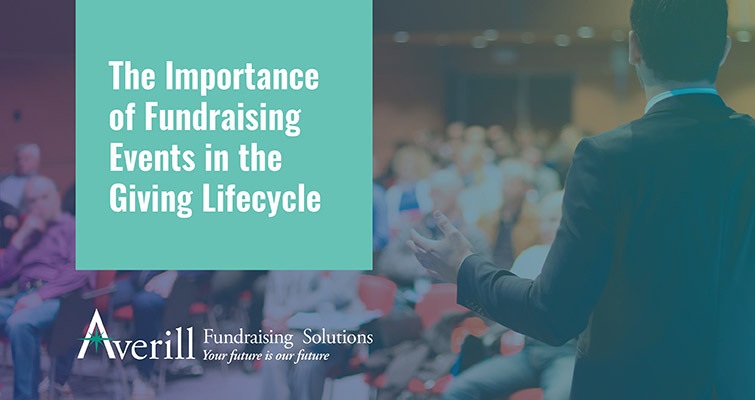 You’ll save yourself and your staff months of time diverted from other types of fundraising and potentially save on expenses, too. You’ll also free up staff members’ availability to do their real jobs at the event. 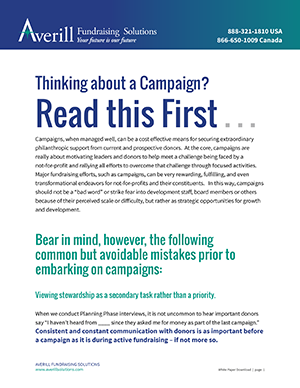 Nonprofits naturally depend on direct mail, email and media-based touchpoints—not just face-to-face interactions—to connect emotionally with contributors in hopes of inducing a click and a gift. Drop prospective givers into the middle of the action, however, and you put color to your cause. People are moved by stories, others’ generosity, and a clear vision of how they, personally, can make a measurable difference whether you’re launching a capital campaign or drilling wells on the other side of the world. Always tie your cause to stories and faces, your why, and how givers can increase their personal impact. With the rise of consumers seeking new experiences and meaningful causes, an event gives you the opportunity to tie your story to their memory of an enjoyable or moving experience. Even if they aren’t moved to give or get involved (i.e. progress to the next giving stage), you’ve raised awareness that may be ignited at a later date as your staff follows up with them or a life event makes your cause personal to them. Pro-Tip: Embed fundraising professionals into your team or event who can help you maximize the impact of your story on the event, as well as its ROI. It may take more than races and galas to create this shift. What Frazier calls “catalytic” events could include trips or tours that allow givers to experience a visceral connection to your recipients’ challenges. While these givers typically represent a smaller percentage of annual revenue for most nonprofits, champions can play a significant role in motivating others into the lifecycle stages that make up 80% of nonprofit revenue (regular and mid-level multi-year givers). Pro Tip: Be aware that a giver’s catalytic event may not even be something you do. Remember, this is a personal journey. Experiencing a life-altering tragedy or coming face to face with their own mortality may be the catalyst that prompts increased giving. No matter the source, catalytic events are most beneficial if you have effectively nurtured the relationship so that yours is the cause givers want to associate their heightened generosity with. Strategically planned and executed events still have their place in an overall giving lifecycle strategy. Know your contributors to ensure that your events are carrying their own weight in revenue raised, new name acquisition, and movement through the giving lifecycle. 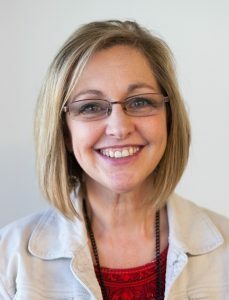 Gina Calvert, Marketing Content Manager at iDonate, has more than 20 years’ experience working with nonprofits and a variety of other organization types. An advocate for authentic, customer-centric messaging, her core focus is on understanding your audience’s motivations to create more engagement and better results.